WASHINGTON (JTA) — Rep. Ileana Ros-Lehtinen, touring Israel on one of her final overseas trips as a congresswoman, is being feted as one of the Jewish state’s best friends in Congress. 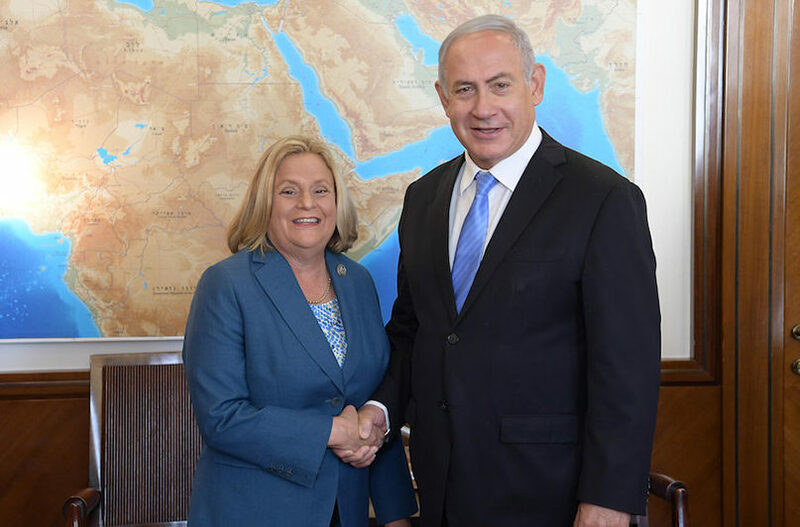 Ros-Lehtinen, a Florida Republican who has served in the U.S. House of Representatives since 1989, met Monday with Prime Minister Benjamin Netanyahu. A day earlier, at a Jewish National Fund ceremony, she planted a tree in her honor outside Jerusalem. “I have said and I’ll say it again, we have never had a better defender of Israel and a better defender of the truth,” Netanyahu told Ros-Lehtinen. Ros-Lehtinen, 66, raised Roman Catholic, is the granddaughter of Turkish Jews who had immigrated to Cuba. Her father, who opposed the communist takeover of the country, fled to the United States in 1960 when Ros-Lehtinen was 8, in 1960. Elected to the Florida House from her Miami-area district in 1982, and then to the state Senate in 1986, she earned a reputation as a moderate Republican who fiercely opposed the Cuban regime. In the Congress, Ros-Lehtinen added leadership on Israel issues to her portfolio. Her passion was foreign affairs, and many of the Israel-related positions she introduced later became orthodoxy not just for Republicans but also for many Democrats. She was the lead Republican advancing the Syria Accountability Act in 2003, which set up the architecture for the U.S.-led isolation of the country after the Assad regime’s bloody repression of a civilian uprising in 2011. The George W. Bush administration gutted the Iran sanctions she hoped to pass in 2006, but her legislation anticipated the sanctions that would pass in 2010 and were used as leverage by the Obama administration to get Iran to the negotiating table to roll back its nuclear program. In the mid-2000s, Ros-Lehtinen introduced multiple bills to choke off funding to the Palestinians unless their leaders renounced terrorism. Ignored by the Bush and then the Obama administration, her recommendations have become Republican orthodoxy under President Donald Trump. In 2011, Ros-Lehtinen became the first woman to chair the House Foreign Affairs Committee. She worked closely with an array of Jewish pro-Israel Democrats, including the late Tom Lantos of California, Howard Berman of California, Eliot Engel of New York and Ted Deutch of Florida. Deutch, the ranking member of the House Middle East subcommittee chaired by Ros-Lehtinen, insisted on naming one of the last Israel-related bills they co-sponsored the Ileana Ros-Lehtinen United States-Israel Security Assistance Authorization Act of 2018. The measure codifies into law the $38 billion defense assistance package to Israel. “My friend Ileana Ros-Lehtinen has been a stalwart friend of Israel throughout her time in Congress, and it is a fitting honor that this bill to strengthen the U.S.-Israel relationship bears her name,” Deutch said on the House floor last month. Her moderation, and her representation of a diverse district, led Ros-Lehtinen to become one of the most outspoken Republican critics of Trump, particularly after he equivocated in assigning blame for a deadly neo-Nazi march in Charlottesville, Virginia, in August 2017. “Blaming ‘both sides’ for #Charlottesville? !” she tweeted. “No. Back to relativism when dealing with KKK, Nazi sympathizers, white supremacists? Part of her calculus in not seeking re-election was the likelihood that antipathy to Trump in her district would lead to her own ouster — and indeed, the Democratic nominee in her 27th District is seen as likely winning the seat. She joins others whose departure this year was spurred in part by the difficulties of being a moderate Republican under Trump, including Rep. Ed Royce of California and Sen. Bob Corker of Tennessee. Royce is the Foreign Affairs Committee chair and Corker leads the Foreign Relations Committee in the Senate. Ros-Lehtinen’s son, Rodrigo, is transgender and is among those leading the charge against a Trump administration proposal that would recognize only one’s birth gender. “Despite the cruel efforts of the Trump administration, trans people #WontBeErased,” Rodrigo Ros-Lehtinen tweeted Monday. Bursting with parental pride, Ileana Ros-Lehtinen, tweeting from Israel, made clear whose side she championed. Did Bernie Sanders just steal Joe Lieberman’s Jewish crown?